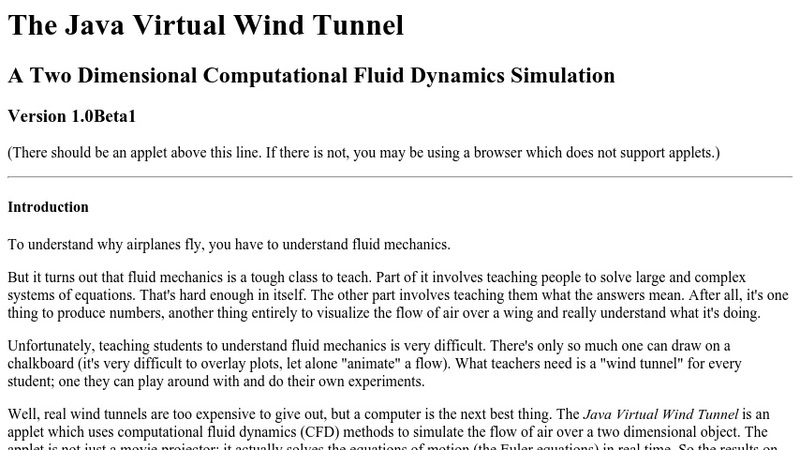 The Java Virtual Wind Tunnel is an applet which uses computational fluid dynamics (CFD) methods to simulate the flow of air over a two dimensional object. The applet is not just a movie projector; it actually solves the equations of motion (the Euler equations) in real time. The Java Virtual Wind Tunnel is just a prototype. But it shows how Java can be used to build educational tools for undergraduate and graduate fluids mechanics courses. At the undergraduate level, the simulations might help students visualize and understand 2-D fluid flow. At the graduate level, it might help students understand the power and limitations of computational fluid dynamics.